By Celine Uwera, YWCA of Rwanda. The ICPD Global Youth Forum 4-6 December 2012, in Bali Indonesia took place with the theme Youth Rights at the Heart of Development. The outcomes and recommendations from the Forum shall contribute directly to the process of defining the future global development agenda. 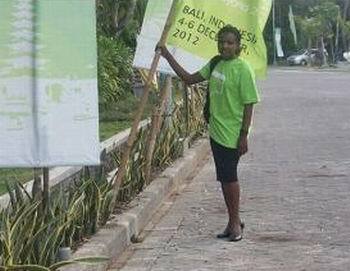 It was my great pleasure to attend and participate in the Global Youth Forum (GYF) organised and funded by UNFPA on the 4th to 6th December 2012, held in Bali, Indonesia. I really thank UNFPA for organising for the first time such an international youth platform which gathered over 900 youth delegates from all over the world. The main objective (which has been achieved) was to give young people the opportunity to contribute directly to defining the new UN Development Agenda Beyond 2015 and the ICPD Beyond 2014 Review as declared by the Executive Director of UNFPA Dr. Babatunde Osotimehim who co-chaired the opening ceremony of the GYF. During the course of the three-days, participants were trained through plenary sessions on theme topics: Staying Healthy, Comprehensive Education, Promoting Transitions to Decent work; Families, Youth Rights and well-being including sexuality; Leadership and meaningful Youth Participation and finally the plenary session on Realising Youth Rights. After each plenary session, a world-café whose topic had a direct link with the previous plenary session was organised to allow young people to discuss different challenges they face in their communities. I liked this because through this channel, young people shared their best experiences and views on how to address those issues. Young people came up with clear recommendations (oriented to Governments, NGOs, Private Sectors and to the International Community) based on the identified priorities. In some recommendations for instance it was highlighted that efforts should be increased to achieve: universal access to free education, comprehensive sexuality education, non-discrimination, equality and gender, investing in people and jobs, participation by all young people, national policies and plans, legal protection funding, empowerment and capacity building and accountability. Personally I feel that the best part of the recommendations is the special emphasis on marginalised and vulnerable people, to ensure their needs are being met. I can say with all honesty that I have benefited from this Global Youth Forum experience because it not only contributed to my capacity building and increased my skills; but also because I was given the opportunity to stand and speak out for the young people representing 43% of the world’s population of 7 billion. Also, as one of rapporteurs, I learned a lot especially in reporting, compilation and summarising recommendations from all the world cafés by ensuring that no idea was lost. Before the GYF, I also attended the training organised for rapporteurs and facilitators; and from both programmes I gained skills and social connections. This is why I want congratulate UNFPA and all those that participated in the organisation of this meeting which was a real success; and I am thankful to World YWCA and YWCA of Rwanda from which I gained empowerment and capacity building. It is true; Government, NGOs, private sectors, the international community and other stakeholders should ensure that voices of youth are heard. However, I also think we as young people have to be more responsible: if we want the change in our future, we have to make it happen. I appreciated the words of the famous singer Agnes Monica who was invited in the opening and the closing ceremony: “Dream. Believe. Make it make it happen”.